Today's post is in addition to my last post on the online carnival sale by Lenskart.com. They are back again with their Eye-Popping sale this time which starts from 11th-14 April. So in case you missed on the previous one, here is a chance for you all to grab the frames of your choice, at prices that best beat all. We all have changed the way we shop . Online is the new graph, and when it comes to eyewear, I don't know none other than Lenskart. 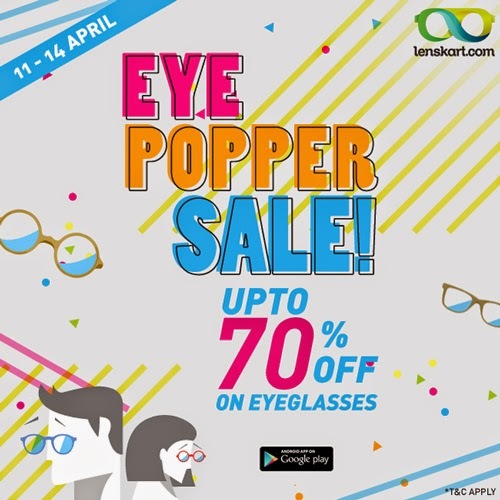 So this is a promotion post, and Lenskart wanted to get the message to all of you as fast as they could, so that ya'll could be the first ones to benefit from this sale , and bring home some stylish frames on your nose. So saving your time into figuring out the layout of the details, Lenskart got in touch with me to run and share the gist of all the offers, so that you know. Here is a creative of what they are offering, so that you could skill to shop straight away coz otherwise you know , stuff on sale fly away as a piece of hot cake. 1. Flat 50% Off on Latest Eyeglasses (*On purchase of Rs 1500 & above) - Anything new , which just hit the online stock is straight off half. Get browsing the latest trends(which btw are about 2000+) ,and when you order, they slash it half for you. 3. Get Your First Frame Free (*Lens Package Start from Rs 799) - Pay for your lens, get the frame free. finally some online brand to start this in India. I bet your local shop could never give you this kind of deal. 7. Reading Eyeglasses at Rs 149 ONLY - This is as good as a free offer. Ideal for everyday wear . I am sure you want to be the first few customers to grab this. Can't risk all of them being sold off . So don't wait up. Disclaimer: This post is an advertisement on account of the upcoming sale for the benefit of all readers.